Are you legally blind and seeking funds for college? Do you know someone who is blind or visually impaired and in need of funds for college or vocational school? Washington Council of the Blind (WCB) provides scholarships for Washington state residents enrolled in a college or vocational/technical school program. The deadline for 2013 applications is the end of this month, August 2013. For more information and an application, please see the WCB website. “I need braille” filled the subject field of an email inquiry. The request was for braille copies of a wedding invitation, reception invitation and reply card. My new client was to be married soon and wanted her friends to have invitations in a form they could read. When the recipient received the invitation, she assumed it was in print and put it aside without opening it. Her reader was coming soon and would read it to her. The reader arrived the following week, opened the envelope, glanced at the contents and handed it back. It was braille, and she couldn’t read braille. What a happy surprise it was for the braille reader to read her mail independently and privately. The braille didn’t stop with the invitation. The thoughtful bride-to-be also asked me to braille two copies of the wedding ceremony program and the words for hymns that were sung. She dressed up the braille programs with lovely ribbons and displayed them alongside similarly decorated print programs to be handed out as guests arrived. 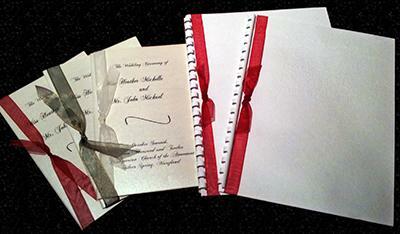 For minimal effort and at nominal cost, we can prepare braille invitations and similar items for your special event. It will be appreciated more than you may realize. January is National Braille Literacy Month. January was selected for the honor because it is the birth month of Louis Braille, the Frenchman who at age 16 created the raised dot method of reading and writing for those who are blind. Those of you who have eyes that see, imagine for a few minutes how your life would be if you had no access to print. You could not read books, newspapers, restaurant menus, street signs, maps, utility bills, or your personal mail. You would have no way to jot down a grocery shopping list, an address or a phone number. You would not be able to write a letter and share your private thoughts without engaging someone to help you. Your only access to information would be through what others choose to tell you or by listening to the radio, TV and other electronic devices. Braille makes all of these things available to those whose eyes do not see. Virtually anything in print can be put into braille. How can you help your braille-reading friends? Send a brailled greeting card to your friend along with your personal braille note. Ask his or her favorite restaurant to have its menus done in braille, perhaps offering to pay the cost if the restaurant balks. Perhaps the church will agree to do its Sunday bulletins in braille, or music lyrics for a blind person who wishes to sing in the choir. Invite a braille-reading friend to your special event with a braille invitation. Have the users manual for a new kitchen appliance done in braille. A little bit of braille can make a big difference. For a nominal cost, we can help with all of these ideas and many more. Every week I braille the Orders of Worship for Seattle’s University Presbyterian Church (UPC) morning and evening Sunday services, as well as special seasonal services. I just finished the braille for the month of December. UPC is a large church with a wonderful music program that includes several choirs and many accomplished musicians performing on organ, piano, strings, brass, wind, and percussion instruments. The music seems especially glorious during the Christmas season, and I find myself singing, humming, smiling broadly and looking upward as I braille the services for the joyous Christmas celebration. Throughout the year, the Church also asks me to braille lyrics for a person who sings in one of the choirs. Thank you, UPC, for your faithful seventeen-year mission to your braille-reading participants. I look forward to the next seventeen years. Did I tell you, I love my work! Thank you to all who requested a free 2013 braille calendar. Your response has been so enthusiastic that we have run out of calendars. Best wishes for a joyful month of December. 2013 braille calendars are here for free distribution to braille readers. The calendars are provided by the American Action Fund for Blind Children and Adults, Tarzana, California. The comb-bound calendar measures a handy 6 by 6 1/2 inches. There is a page for each month. Major holidays are listed at the bottom of the appropriate page. Additional free services provided by the American Action Fund are a Children’s Lending Library, pre-school through high school, available in the U.S. and Canada and a Newspaper for Deaf-Blind Adults, sent internationally. To request a calendar, you may use the comment feature at the end of this blog post, or call Carolyn’s Braille Services at 425-778-8428. To protect your privacy, please don’t post your mailing address in the comment. I will email you to ask for a mailing address soon after I read your request. Calendars will be sent FREE MATTER FOR THE BLIND to those eligible for this mailing privilege. “It changes the lives of our braille readers,” said Susan Quinn of the braille menu lists and meals heating instructions, recently updated by Carolyn’s Braille Services. Susan is a Social Work Intern with Meals On Wheels, a service of Senior Services of King County. Each week, Meals On Wheels delivers thousands of frozen meals throughout King County to homebound people age 60 or more, thus helping them to eat well and remain independent. Clients telephone in their meal orders, choosing from a list that contains 33 options. Braille readers have that list in braille, a format they can read independently. The nutritious meals are packaged to be stored in the freezer and heated in a microwave or a conventional oven. Each meal is marked in braille, eliminating guess work for blind clients as to its contents. Heating instructions customized for each meal are also available in braille. Seattle seniors may use the Mobile Market, a home delivery program where individuals order by phone from a list of groceries and other supplies. That list, too, is in braille. Meals On Wheels of King County is part of the Meals On Wheels Association of America, the oldest and largest national organization composed of and representing community-based Senior Nutrition Programs in the 50 U.S. states and Territories. There are approximately 5,000 local Senior Nutrition Programs in the United States. Each day, these programs provide one million meals to qualifying seniors. Meals may be served at community locations like senior centers or delivered directly to the homes of seniors with limited mobility. Many programs provide both services. We are digressing from our customary focus on braille/literacy related topics to share an invitation we just received. The Easter Egg Hunt, staged especially for children who are visually impaired, happens this coming Saturday, March 31, at the Tukwila Community Center, Tukwila, Washington. It sounds like a fun family outing. You are invited to a Very Special Easter Egg Hunt for Children who are Visually Impaired and their families, sponsored by The Green River Valley Combined Club of CenturyLink Pioneers. There will be Beeping Easter Eggs, the Egg Hunts and a social time for families to visit, and enjoy refreshments. Our special guests will be guide dog puppies brought to us by the families that raise them in this area. The Green River Valley Combined Club is a unit of the Washington State Chapter 30 Pioneers. Our sponsoring Corporation is CenturyLink Communications. The Club consists of volunteers who are active or retired from the Telecommunications Industry. If you plan to attend please RSVP to: Marlynne Olson or Jerry Olson. Take the Interurban/Tukwila Exit; turn LEFT Onto Interurban Ave.
My mentor, colleague and friend died last week. She was 92. For more than half a century, Jeanne Horsey was devoted to bringing the benefits of braille to those who are blind. Her accomplishments left a long trail that continues to touch lives and open doors. I met Jeanne in 1990 when I arrived at her Seattle home for my first braille lesson. I, too, wanted to work with people who are blind and knew that braille and literacy were essential elements in what was to become my life’s work. I was the only interested student at that time. I didn’t want to wait, so Jeanne gave me private instruction. She let me gallop along at my own pace as long as my lessons met her high standards. Once a week at 10 o’clock in the morning, we sat at her dining room table, and I learned braille. The first lesson, however, happened in the kitchen where she was helping her retired husband prepare his mid-morning breakfast. She put a Perkins brailler on the kitchen table, opened the manual to a chart of the braille alphabet, and told me to braille three rows of the letter “a,” then “b” and on through to “z.” I left that morning knowing the braille alphabet. One morning when I arrived for my lesson, I noticed pages of brailled paper hanging from a cord strung across the deck. Jeanne explained she had shellacked those pages to make the delicate raised braille dots more durable, and she had hung them out to dry. That was but the first of many surprising things I learned from Jeanne. Jeanne is largely responsible for getting braille textbooks in the Washington state public schools. Back in the 1950’s when she worked for the Seattle School District, she was dismayed at the dearth of braille materials available for blind students. As often happens with new endeavors, Jeanne met with numerous obstacles. Undaunted, she learned braille and was certified by the Library of Congress as a literary braille transcriber. She taught the course to others — parents, teachers, friends, anyone who wanted to learn — and developed a cadre of braille transcribers eager to produce braille. Jeanne founded Seattle Area Braillists (SAB), a nonprofit organization dedicated to transcribing textbooks into braille for the schools. This dedicated group of highly skilled ladies spent most of their waking hours transcribing textbooks for all grade levels to be used by students throughout the state. Collectively, SAB members held Library of Congress certifications in Literary Braille Transcribing, Braille Mathematics Transcribing, and Music Braille Transcription. They knew the complicated Code of Braille Textbook Formats and Techniques. Some were skilled at creating exquisite hand-made tactile drawings, illustrations, and maps. At Jeanne’s invitation, I joined SAB (I was the youngster of the group), received my Library of Congress Literary Braille certification, and was assigned a fourth grade Washington State History textbook to transcribe. This was before the advent of computer programs in the braille transcribing world; all work was done by hand with the Perkins brailler. For those not familiar with the Perkins brailler, using one can be compared to typing on an old manual Underwood, being very careful not to make a mistake because of the difficulty or impossibility of making a neat correction. Jeanne always had an interest in art, but she didn’t have time to pursue it until later in life. She loved to experiment with various media. It is interesting, and perhaps fitting, that one of her early art projects involved using sheets of thin metal left over from her years of making tactile maps for students who were blind. She used a repoussé technique to create tactile shapes and images in the metal, highlighting the designs with acrylic paint. 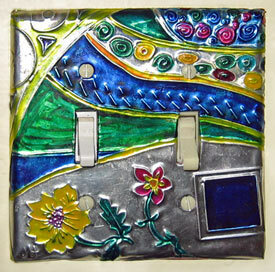 I have replaced most of the electric switch plate covers in my home with Jeanne Horsey repoussé originals. Recently Jeanne and her son, David Horsey, political cartoonist and holder of two Pulitzer Prizes, opened a joint art exhibit at Aljoya Thornton Place in Seattle. Jeanne’s display included a selection of watercolors and some mixed-media work. David contributed 15 recent color cartoons produced for the Seattlepi.com. It was a high point for mother and son. The show closed February 21, 2012, just one day before Jeanne’s passing. 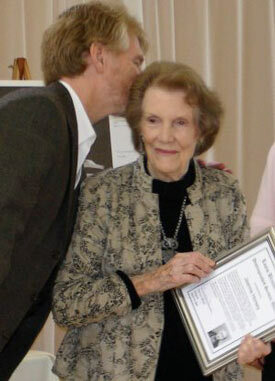 Rest in peace, dear Jeanne, knowing that your legacy continues. The Acacia Memorial Park and Funeral home posts an obituary in memory of Jeanne Horsey. There is an online guest book where friends can share with her family. This video clip is special. Be patient, it begins with a commercial.